I had heard about the chiringuito Los Sardinales from my friend Lena but never got around to try it. Well, they’ve just opened a branch right on the Golden Mile across the street from the Marbella Club. Great location for a seafood restaurant and perfect for Sunday lunch when lots of places are shut. The interiors are simple – white walls with accents of blue on the tabletop. The menu is straightforward – a short list of salads, seafood starters including boquerones (fritos, al vinagre and al limon), calamares and the deliciously spicy gambas pil-pil. Main courses are mostly fish – grilled, roasted or baked in sea salt. While reading the menu, we were given a small bowl of yummy garlicky green olives. We chose a mixed salad with boqueronos al limon and gambas pil-pil to start followed by pan-fried sole for me and grilled swordfish with caper butter for my husband. 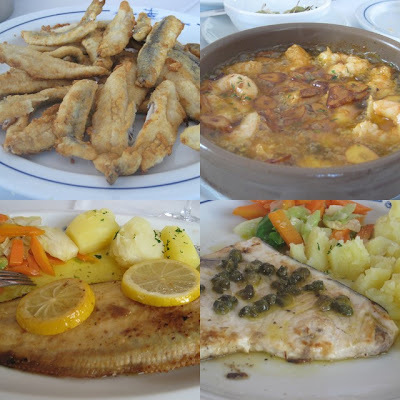 The food came quickly and was simply prepared – gambas were large shrimps in spicy garlicky olive-oil, the boquerones were crispy and lemony and the fish was simply presented and very fresh. Prices are reasonable as the portions were quite large. No room for dessert so after a quick lunch, we headed home to spend the rest of the afternoon reading in the sun. P.D. Jan 2010 – this restaurant has now closed and is B.Ayres, an Argentine-themed grill restaurant.